My thanks to: Professor Horace David Ritchie (dad), Grandpa Prentice, Hugh Woodcock (DCPS), Roger Shakeshaft (DCPS), Mr Ashenhurst (DCPS), Chris Wall (Dulwich College), Esmond Rand (Dulwich College), Classics Master Tomlinson (Dulwich College), Graham Findlay, Dr Ray Mitchell, Dean Green of Queens, Prof Thompson (Feit Thompson theorem), Dr Hyland (Logic at Cambridge), Dr Martin Powell (Algebra at Oxford), Clifton Turner (JW study conductor), Tony Moore, Massoud Vakili, Dulwich College Preparatory School, ILEA (funding), Magdalene College Cambridge and Magdalen College Oxford, for teaching me to think gracefully. Woe to you scribes and Pharisees, hypocrites! because you shut up the kingdom of the heavens before men. For you yourselves do not go in, neither do you permit those on their way in to go in (Matthew 23:13). The reader will see from the history of the battle below how the Governing Body of the Jehovah’s Witnesses (with the partial exception of Daniel Sydlik) have taken just such a position with my research. It is so hypocritical given that their original name was ‘International Bible Students’. It is my fervent hope, and my strong resolve that I and that the Life, the Lord’s Witnesses, the Bible Decoders, will always encourage bible research from all of the members of the congregation and indeed from anybody else! Whether such research agrees with our present understanding or whether it shoots it down in flames entirely! The best way to ensure that this occurs is always to admit publicly the possibility that any of the currently accepted interpretations may be wrong. We have to be academic in our approach to bible understanding here and not professional or political! Dammit they could all be wrong! It is up to the reader to decide! But this is how one follows God, one simply obeys the best bible information that one has at the time! I hope that the reader will see that this website has this information and by some considerable margin right now. I hope that he or she will help us to improve it in the little time that is left. And I hope that God gives us all the grace to see it! God can reveal his true interpretations to anybody! Sinners and righteous alike, rich and poor, well educated and barely educated, powerful and powerless, good and bad, healthy and sick, church goers and church haters, straight and crooked, guilty and innocent, men and women and children. His arm is never cut short, and there is nothing that is too extraordinary for him. He can reveal them! But only those who love him will accept them. Blessed are the pure in heart for they shall see God (Matthew 5:8). For they loved the glory of men more than even the glory of God. However, Jesus cried out and said: He that puts faith in me puts faith, not in me [only], but in him [also] that sent me; and he that beholds me beholds [also] him that sent me. I have come as a light into the world, in order that everyone putting faith in me may not remain in the darkness (John 12:43-46). N.B. Many of the understandings in these historical letters and books are wrong and many (but not all) have now been corrected. Below is a list of most of the correspondence between us, it was rather one way! I have lost one or two letters I think. l1981 Invented electric quadracopter but did not patent it due to the Benson Skymat. 1987Tishri22 Gordon sanctified and 2NC Made between Jacob and Gordon - somehow? Became a living image of God !! 1991Tishri approx Given talk about three rights of the firstborn in Kingdom Hall on a Thursday Evening. 1992January28 Watchtower become affiliated to the UN DPI as a UN NGO. The harlot starts riding the beast. 1992February Sharon Thomas from the Leytonstone congregation of Jehovah's Witnesses works out that the Kingdom of God begins in 2008 from the corresponding ransom of Jesus aged 33½ for Adam who sinned aged 33½. 1993Tammuz18 Saturday, July 10th, Baptised into the Jehovah’s Witnesses at Crystal Palace. Gordon knew that he would be thrown out. He was already baptised from heaven as Elijah4. 1994Tammuz21 Gerrit Loesch joins Governing Body effective July1, 1994. 1994Heshvan30 [AF] Covering letter to Todd Ellison: Talks about talks. 1995November9 [U] Letter to the Governing Body asking: Who really is the FDS? 1996May20 [Z] Letter of disgust to the 100 congregations in New York. 1999Elul26 Gordon Realised that the 7 years of eyes of Revelation 5 had ended and the 7 years of horns had started. Seeing ends, power starts. He was antitypical Joseph the 1st horseman of the apocalypse. Time to go conquering. Time to go subduing in the midst of his enemies. Gran Canaria Thurs night 9th September 1999. 1999Heshvan21 Perhaps Gordon started working on this website (the LW constant feature)? This was 4600 solar days of Daniel8 before 2012Sivan16, when the LW holy place came into the right condition - being non adamic? 2000January25 1999Shebat14: This website is advertised by Fax in the UK. 2000January26 before 2pm 1999Shebat14: This website is advertised by Fax in the US. First responses to fax adverts 'Calling all Christians'. 2000April/May/June Weekly talks at the Cumberland Hotel, W1, very large leaps in our understandings were made. 2000Tishri16 The 2NC celebrated 30 days late due to new understandings of how to celebrate it. Jamie, the 3rd LW, was 'water' baptised by Gordon (through the laying on of hands) on this day. 2000November Gordon Ritchie, Gary McCaffery and later Justin Pugsley and Richard Williamson invent HyperOs, software that runs Microsoft Windows entirely from system RAM, and runs several copies of Windows without multibooting. Gordon wished to show an incredulous World that he is good at computer coding, in order to establish credibility with bible decoding (this was his excuse in any event). Writing software that competes with Microsoft is light relief from bible decoding intellectually. But it is not as satisfying spiritually obviously. 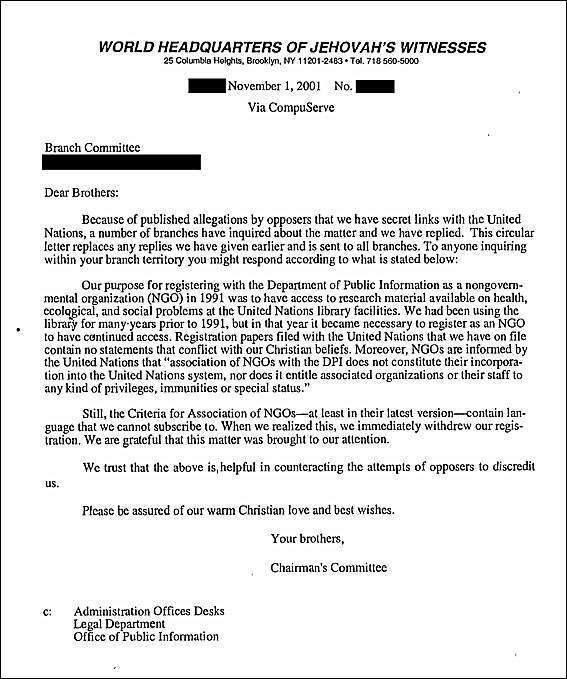 2001October9 UN DPI Disassociated the Watchtower from the UN at the Watchtower's request. 2001October22 2001Tishri30. 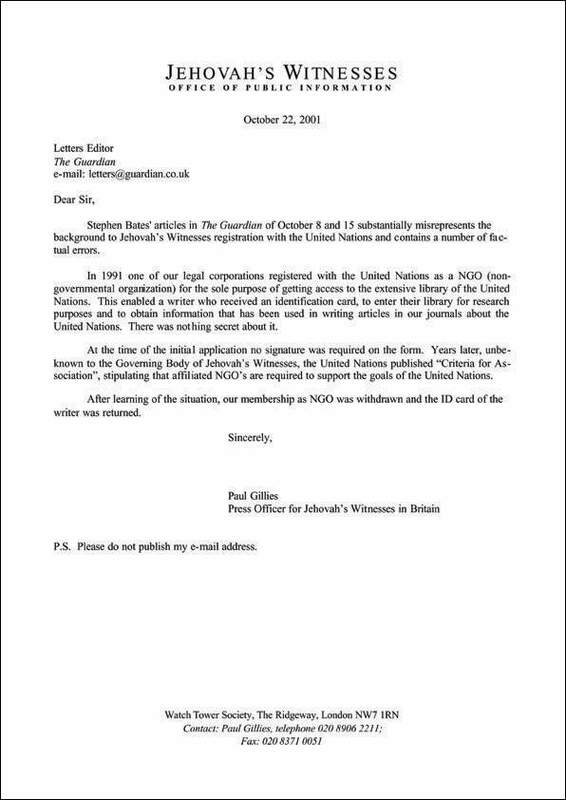 Paul Gillies writes to the Guardian in response to their two articles on October8 and October15 falsely accusing the Guardian of misrepresenting and saying himself that the Watchtower only joined the UN as an NGO affiliated with the DPI in order to gain a library card. The writer visited the UN office when it was in Millbank towers in London and was able to get any book he wanted from the UK office or the Library in the UNs Manhattan HQ via the UK office, without needing a library card and without needing to go to the US. So the Harlot dismounted the beast due to her being exposed. See letter from Paul Gillies. 2001November1 2001Heshvan10/11. Watchtower HQ writes to all the branch offices in every nation re-iterating the library card lie and recommending that all the branches use the same lie to deflect righteous criticism of their putting Satan's throne in God's temple and riding the wild beast of Revelation as a harlot church. See Letter to Branches. 2002Elul16 2002August27. Baptised Roger Knight at what we thought was the correct date for a 2NC celebration. He then went off to AOL (the angel of Laodicea) and formed an LW church within the JWs, the congregation of Laodicea, the 7th congregation of Revelation 2/3. 2003Elul14-16 Laodicea commences, with the baptism by Roger Knight of the second member (calculated as 430 years a month for a day (14 years and 4 months) before 2017Tebbeth14-16, the Laodicean Passover to Laodicea first fruits This was necessary for them to do in order celebrate the 2NC and keep their 2NC kingship and stolen 4EC baptism on 2003Elul16 (when we used to hold it back then). 2003August/September Gordon begins to realise that HyperOs was not what God wanted him to be doing. The period from 2000 to 2003 should have been used to further bible understanding, not to attempt to compete with Microsoft. A wasted opportunity. But Gordon's false step means an opportunity for the rest of the world. So come on you men and women with faith. Be modern day interpretational prophets and prophetesses, come and decode the bible with us and feed on the divine truth, there is nothing on earth like it! 2006Nisan18/19 April17: Red Lobster letter sent to Don Adams comparing the Passover celebrated by Reggie (and LW student) with the JWs to the Passover celebrated in Chicago by the LWs. 2006Nisan21 Emailed the church saying: Dan Sydlik has died and "I am going to write another fax to Don Adams. This one will go into Jesus not drinking the cup or eating the meal again until he does it new in the kingdom of his father. I will copy everyone in on this fax. In the final analysis, we must act out of faith and love, not fear and self-interest. And we must do that whilst we still can!" 2006Nisan21 (22/23) 2nd Letter to Don Adams instructing him how to celebrate the Lord's Evening Meal, sent between 01:57 April20 and 05:13 April22, 2006. It would have been during the day on April21. Gordon does not take long to write a letter. 2006Sivan24/Tammuz2-6 Second Watchtower Destruction date (or date of first publishing of 2nd Watchtower destruction date). 2010Chislev20-23 The first fire sign of 1Kings18 occurs. The largest fire in modern Israel's history upon mount Carmel. 2013Tebbeth18-Shebat1 Our 400th fire sign prediction failure (counting 2010Chislev21 - when the first fire sign occurred). Hopefully we have by now learned that interpretations belong to God and that we only get them if he permits it. The bar is set slightly above human intelligence so that the holy spirit needs to give us a foot up in order that we can see over the wall into the garden of God. We should not have implied that God would execute a nuclear judgement upon the Watchtower Bethel. Satan kills with nuclear bombs. God kills with Passovers. He will execute a New Passover judgement upon the Brooklyn Bethel and upon all the other Bethels and then upon all the congregations and then upon all those who have left the congregations of the Watchtower but not joined another church (those in the prison hole). 2015Adar16 Made the 533rd subprediction of 2015Adar20-25. 2015Adar24 Made the 534th subprediction of 2016Nisan1/2. 2015Adar29=2016Nisan4 Made the 535th subprediction of 2016Nisan6/7. 2016Nisan8 Made the 536th subprediction of 2016Nisan8-10. 2016Nisan10 Made the 404th main prediction of 2016Iyyar6-11 and the 537th subprediction of 2016Iyyar6-8. 2016Sivan7/9 Got/published the 539th subprediction of 2016Sivan10-12. 2016Sivan12 Got the 540th subprediction of 2016Sivan27-28, 10x of testing of God after the contest started on 2006Sivan12..
2016Sivan15 Published the 540th subprediction of 2016Sivan27-28 on the 24th day of the 9th late 1NC Pentecost of the Kingdom of Haggai2. 2016Tammuz8 Published the 542nd subprediction of 2016Tammuz10/11 for the 2nd fire sign at 06:16 on 16June16 which is 6-16 of 6-16. 2016Tammuz13 Got and Published the original 543rd subprediction of 2016Ab8-10 and 2016Ab10-12 for the 2nd and 3rd fire signs at 08:55 on 2016June21. 2016Ab7 Re-published the original 543rd prediction as the 544th prediction. 2016Ab10 Got and Published the 545th subprediction of 2016Ab10-12 and 2016Elul4-6 or 2016Elul6-10 and the main prediction extension of 2016Iyyar6-Elul14. 2016Ab17 Re-Published the 545th subprediction of 2016Elul4-6 and 2016Elul6-10 with the second period extended backwards by 2 days. 2016Elul9 Got and Published the 546th subprediction of 2016Tishri4-6 and 2016Tishri6-8 and the 404th main prediction extension of 2016Iyyar6-Tishri14. This was the last prediction for the JW wilderness period in accordance with Numbers33 - see U364..
2016Tishri11 Published the 547th subprediction of 2016Heshvan4-6 and the 404th main prediction extension of 2016Iyyar6-Heshvan14. 2016Heshvan6 Got the 548th subprediction of 2016Heshvan9-12 and the 404th main prediction extension of 2016Iyyar6-Heshvan14. 2016Heshvan7 Published the 548th subprediction of 2016Heshvan9-12 and the 404th main prediction extension of 2016Iyyar6-Heshvan14. 2016Heshvan12 Got the 549th subprediction of 2016Heshvan20-22 and the 404th main prediction extension of 2016Iyyar6-Chislev1. 2016Heshvan13 Published the 549th subprediction of 2016Heshvan20-22 and the 404th main prediction extension of 2016Iyyar6-Chislev1. 2016Heshvan22 Published the 550th subprediction of 2016Heshvan23-25 or 2016Heshvan29-Chislev1 and the 404th main prediction extension of 2016Iyyar6-Chislev1. 2016Heshvan26 Published the 550th subprediction 2nd option reasoning for 2016Heshvan29-Chislev1. 2016Heshvan30 Got the 551st subprediction for 2016Chislev2-9, from the malediction deferred first kingdom 1NC Pentecost. 2016Chislev1 Published the 551st subprediction for 2016Chislev2-9. 2016Chislev9 Got the 552nd subprediction for Hanukkah, 2016Chislev25-Tebbeth2. 2016Chislev13 Published the 552nd subprediction for Hanukkah, 2016Chislev25-Tebbeth2. 2016Tebbeth1 Given the 1st extended 552nd subprediction for 2016Chislev25-Tebbeth7 and discovered the now known to be non existent Laodicean 2NC Pentecost from Tishri16-Chislev5. 2016Tebbeth2 Published the 1st extended 552nd subprediction for 2016Chislev25-Tebbeth7. 2016Tebbeth7 Got and published the 2nd extended 552nd subprediction for 2016Chislev25-Tebbeth9 with the now known to be non existent late Laodicean 2NC Pentecost date of 2016Tebbeth8. 2016Tebbeth9 Got and published the 3rd extended 552nd subprediction for 2016Chislev25-Shebat1 with the now known to be non existent late Laodicean 2NC Pentecost date of 2016Tebbeth26. 2016Tebbeth9 Got and published the extended 404th main prediction for 2016Iyyar6-Shebat10. 2016Tebbeth10 Realised that the now known to be non existent late Laodicean 2NC Pentecost was more likely to be 2016Tebbeth30, a late version of the late 2NC Pentecost. 2016Tebbeth11 (4-6pm on 2016December14, the very start of 2016Tebbeth11) Realised that 2nd appointments over 1NCs occur at 2nd 1NC first fruits and 2nd appointments over 2NCs occur at 2nd 2NC first fruits. Therefore the new Laodicean 2NC Pentecost (which we now know does not exist) had to be 2016Chislev30. So the late new Laodicean 2NC Pentecost had to be 2016Tebbeth30. Published this revised date for it. 2016Tebbeth28 Revised our expected date of the 2nd fire sign from 2016Tebbeth26 (the weekly Sabbath) to 2016Tebbeth29 (the 7th Sabbath of late Laodicean 2NC Weeks on 2016Tebbeth28 (published at 21:36 on 2017January1). 2016Shebat1 Got and published the 4th extended 552nd subprediction for 2016Chislev25-Shebat22, with 77th contest BLC Pentecost on 2016Shebat21. 2016Shebat22 Published the 5th extended 552nd subprediction for 2016Chislev25-Adar2, with 24th Baalian Pentecost and 78th God testing Pentecost on 2016Shebat30. 2016Adar2 Realised that the final extension to the 404th main prediction and the 5th extension to the 552nd subprediction runs from 2016Iyyar6-VeAdar10 and from 2016Chislev25-VeAdar2, due to the intercalary VeAdar this year. And that the 24th Baalian Pentecost from 2013Heshvan1 is 2016Adar1/VeAdar1 and the 78th God testing Pentecost from 2006Iyyar1 is 2016Adar1/VeAdar1. 2016VeAdar1 Got the 6th extended 552nd subprediction for 2016Chislev25-2017Nisan8, with 24th Baalian Pentecost from 2013Chislev1, the fall of Laodicean as a true church to 2016VeAdar30=2017Nisan6 and 78th God testing Pentecost by the Watchtower for a sign from 2006Sivan1 to 2017Nisan1=2016VeAdar25. This was the 2nd answer of 1Kings18. 2016VeAdar2 Published the 6th extended 552nd subprediction for 2016Chislev25-2017Nisan8, with 24th Baalian Pentecost from 2013Chislev1, the fall of Laodicean as a true church to 2016VeAdar30=2017Nisan6 and 78th God testing Pentecost by the Watchtower for a sign from 2006Sivan1 to 2017Nisan1=2016VeAdar25. 2017Nisan7 Got and Published the 7th extended 552nd subprediction for 2016Chislev25-2017Nisan13, with 78th God testing Pentecost by the Watchtower for a sign from 2006Sivan12, the first prediction to 2017Nisan11. 2017Sivan11/12 Got/Published the 12th extended 552nd subprediction for 2016Chislev25-2017Tammuz8. 2017Tammuz7/8 Got/Published the 13th extended 552nd subprediction for 2016Chislev25-2017Tammuz12 and the correct 3rd fire sign festival of 2017Ab5 (as the 4th fire sign). 2017Tammuz11 Got/Published the 14th extended 552nd subprediction for 2016Chislev25-2017Tammuz22 and the 404th main prediction extension from 2016Iyyar6-2017Ab14 (correct 3rd fire sign festival) . 2017Tammuz22 Got/Published the 15th extended 552nd subprediction for 2016Chislev25-2017Ab8. 2017Ab7 Got/Published the 16th extended 552nd subprediction for 2016Chislev25-2017Elul8 and the 404th main prediction extension of 2016Iyyar6-2017Elul14. 2017Elul5/7 Got/Published the 17th extended 552nd subprediction for 2016Chislev25-2017Tishri8 and the 404th main prediction extension of 2016Iyyar6-2017Tishri14, and the 3rd fire sign prediction for 2017Tishri5. 2017Elul11/12 Got/Published the 2nd fire sign prediction for 2017Elul19, the 90th Watchtower Solar Baalian Pentecost from 2005Sivan10, 16 years precisely after 911, 2001 (2001Elul19). 2017Elul11/20 Got/Published the 2nd fire sign prediction for 2017Elul24, the 27th Laodicean Solar Baalian Pentecost from 2013Shebat1 . 2017Tishri5/7 Got/Published the 18th extension to our 552nd subprediction for 2016Chislev25-2017Heshvan8 and the 404th main prediction for 2016Iyyar6-2017Heshvan14, with the 2nd fire sign on 2017TIshri20 or Heshvan1 and the 3rd on 2017Heshvan5. 2017Tishri27 Published: The EU and the UN and the last 16 months of this world from Daniel 7 video on youtube. Coined the word GLOZIs for global socialists, the modern day national socialist worker party members, the modern day NAZIs. 2017Heshvan5/7 Got/Published the 19th extension to our 552nd subprediction for 2016Chislev25-2017Chislev8 and the 404th main prediction extension for 2016Iyyar6-2017Chislev14, with 2nd fire sign on 2017Heshvan9 or 2017Heshvan11 or 2017Heshvan14 and 3rd fire sign on 2017Chislev5. 2017Heshvan21 Got the 4th fire sign as 2017Chislev21, 7 times after the 1st fire sign. 2017Heshvan22 Published the 4th fire sign of 1Kings18 as 2017Chislev21. 2017Chislev5/7 Got/Published the 30th extension to our 552nd subprediction for 2016Chislev25-2017Chislev22, and main prediction for 2016Iyyar6-2017Chislev22 and 2017Chislev10 and 2017Chislev21, for the 2nd and 3rd fire signs. 2017Chislev22 Got/Published the 21st extension to our 552nd subprediction from 2016Chislev25-2017Tebbeth2, from Hanukkah to Hanukkah, and main prediction from 2016Iyyar6-2017Tebbeth2, with 2nd and 3rd fire signs on 2017Chislev27 and 2017Chislev29. 2017Chislev30 Updated the fall of the Watchtower to 2005Sivan11 and the 92nd Baalian Solar Pentecost therefrom to 2017Chislev30, for the 2nd and 3rd fire sign predictions, still under the 21st extension to our 552nd subprediction for Hanukkah 2017. 2017Chislev30/Tebbeth1 Got/Updated the fall of the Watchtower to 2005Sivan12 and the 92nd Baalian Solar Pentecost therefrom to 2017Tebbeth1, for the 2nd and 3rd fire sign predictions, still under the 21st extension to our 552nd subprediction for Hanukkah 2017. 2017Tebbeth2 Got/Published the 22nd extension to our 552nd subprediction from 2016Chislev25-2017Tebbeth22, with the 2nd fire sign on 2017Tebbeth10, the 26th Laodicean Baalian Pentecost from 2014Sivan1 and the 3rd fire sign on 2017Tebbeth21, the late late 2NC Pentecost. 2017Tebbeth10/11 Got/Published the 22nd extension to our 552nd subprediction from 2016Chislev25-2017Tebbeth22, with the 2nd fire sign on 2017Tebbeth11, the 26th Laodicean Baalian Pentecost from 2014Sivan1 and the 3rd fire sign on 2017Tebbeth21, the late late 2NC Pentecost. 2017Tebbeth13 Got/Published the 23rd extension to our 552nd subprediction from 2016Chislev25-2017Shebat2, with the 2nd fire sign on 2017Tebbeth21, the late late 2NC Pentecost and the 312th Asheraian Solar Pentecost from 1975Iyyar18 (May1) when the WTBTS adopted the 2/3 majority vote following the Cardinals of the Catholic Church, and the 3rd fire sign on 2017Shebat2, the 91st Watchtower Baalian Pentecost from 2005Sivan12. 2017Tebbeth23 Got/Published the 23rd extension to our 552nd subprediction from 2016Chislev25-2017Shebat2, with the 2nd fire sign on 2017Tebbeth27/28, the 51st Asheraian Pentecost from 2010Chislev28, when we accepted and published the first fire sign as being the 2010Chislev20-23 fire upon mount Carmel, the largest fire in the history of modern Israel. 2017Tebbeth29 Got/Published the 23rd extension to our 552nd subprediction from 2016Chislev25-2017Shebat2, with the 2nd fire sign on 2017Tebbeth29, the 2kings1 exclusive chief of the 51st Asheraian Pentecost from 2010Chislev28, when we accepted and published the first fire sign as being the 2010Chislev20-23 fire upon mount Carmel, the largest fire in the history of modern Israel. 2017Tebbeth30 Got/Published the 23rd extension to our 552nd subprediction from 2016Chislev25-2017Shebat2, with the 2nd fire sign on 2017Tebbeth30, the 2kings1 inclusive chief of the 51st Asheraian Pentecost (which is that Pentecost) from 2010Chislev30, the 1st no show prediction after the 1st fire sign. 2017Shebat1 Got/Published the 23rd extension to our 552nd subprediction from 2016Chislev25-2017Shebat2, with the 2nd fire sign on 2017Shebat1, the 2kings1 inclusive chief of the 84th Asheraian Pentecost (which is that Pentecost) from 2006Sivan1, the 1st no show prediction. 2017Shebat2 Got/Published the 24th extension to our 552nd subprediction from 2016Chislev25-2017Shebat14, with the 2nd fire sign on 2017Shebat1/2, the 91st Baalian Pentecost from 2005Sivan12, the fall of the Watchtower as a true church, and the 3rd fire sign on 2017Shebat11/12, the 84th Asheraian Pentecost from 2006Sivan12, the 1st no show prediction. 2017Shebat2/3 Got/Published the 25th extension to our 552nd subprediction from 2016Chislev25-2017Shebat22, with the 2nd fire sign on 2017Shebat4, the 85th Asheraian Pentecost from 2006Sivan12, the 1st no show prediction, and the 3rd fire sign on 2017Shebat21, the 93rd Baalian solar Pentecost from 2005Sivan12, the fall of the Watchtower as a true church. 2017Shebat5/6 Saw/Published the 26th extension to our 552nd subprediction from 2016Chislev25-2017Adar11, with the 2nd fire sign on 2017Shebat11, the 84th Asheraian Pentecost from 2006Sivan12, the 1st no show prediction, and the 3rd fire sign on 2017Adar5, the Laodicean Pentecost from 2017Tebbeth16, when Laodicea was re-appointed as a true non adamic but dry church, a dry land. 2017Shebat13 Saw/Published the 26th extension to our 552nd subprediction from 2016Chislev25-2017Adar11, with the 2nd fire sign on 2017Shebat21, the 93rd Baalian Solar Pentecost from 2005Sivan12, the fall of the Watchtower as a true church and the 3rd fire sign on 2017Adar3, the 86th Asheraian Solar Pentecost from 2006Iyyar21, the 1st no show prediction (for a warning bomb), and the 4th fire sign on 2017Adar5, the Laodicean Pentecost from 2017Tebbeth16, when Laodicea was re-appointed as a true non adamic but dry church, a dry land. 2017Shebat21/22 Saw/Published the 26th extension to our 552nd subprediction from 2016Chislev25-2017Adar11, with the 2nd fire sign on 2017Shebat23, the 93rd Baalian Solar Pentecost from 2005Sivan14, the fall of the Watchtower as a true church and the 3rd fire sign on 2017Adar3, the 86th Asheraian Solar Pentecost from 2006Iyyar21, the 1st no show prediction (for a warning bomb), and the 4th fire sign on 2017Adar5, the Laodicean Pentecost from 2017Tebbeth16, when Laodicea was re-appointed as a true non adamic but dry church, a dry land. 2017Shebat23/24 Saw/Published the 26th extension to our 552nd subprediction from 2016Chislev25-2017Adar11, with the 2nd fire sign on 2017Shebat24, the 92nd Baalian Pentecost from 2005Iyyar14, the fall of the Watchtower as a true church, and the 3rd fire sign on 2017Adar5, the Laodicean Pentecost from 2017Tebbeth16, when Laodicea was re-appointed as a true non adamic but dry church, a dry land, and the 4th fire sign on 2017Adar10, the 85th Asheraian Pentecost from 2006Iyyar21, the 1st no show prediction (for a warning bomb). 2017Shebat25 Saw/Published the 26th extension to our 552nd subprediction from 2016Chislev25-2017Adar11, with the 2nd fire sign on 2017Shebat25, the 2Kings1 exclusive chief of 2017Shebat24, the 92nd Baalian Pentecost from 2005Iyyar14, the fall of the Watchtower as a true church, and the 3rd fire sign on 2017Adar5, the Laodicean Pentecost from 2017Tebbeth16, when Laodicea was re-appointed as a true non adamic but dry church, a dry land, and the 4th fire sign on 2017Adar10, the 85th Asheraian Pentecost from 2006Iyyar21, the 1st no show prediction (for a warning bomb). 2017Shebat26 Saw/Published the 26th extension to our 552nd subprediction from 2016Chislev25-2017Adar11, with the 2nd fire sign on 2017Shebat27, the 86th Solar Asheraian Pentecost from 2006Iyyar14, when we saw our first no show prediction for a warning bomb on 2006Iyyar21, and the 3rd fire sign on 2017Adar5, the Laodicean Pentecost from 2017Tebbeth16, when Laodicea was re-appointed as a true non adamic but dry church, a dry land, and the 4th fire sign on 2017Adar13, the 94th Solar Baalian Pentecost from 2005Iyyar14, the fall of the Watchtower as a true church. 2017Shebat27/28 Saw/Published the 26th extension to our 552nd subprediction from 2016Chislev25-2017Adar11, with the 2nd fire sign on 2017Shebat29, the 86th Solar Asheraian Pentecost from 2006Iyyar16, the publishing of our first no show prediction for a warning bomb on 2006Iyyar21, and the 3rd fire sign on 2017Adar5, the Laodicean Pentecost from 2017Tebbeth16, when Laodicea was re-appointed as a true non adamic but dry church, a dry land, and the 4th fire sign on 2017Adar13, the 94th Solar Baalian Pentecost from 2005Iyyar14, the fall of the Watchtower as a true church. Moses was led out of Egypt and through the wilderness by the pillar of fire and cloud - all these fire signs. Each nuclear attack WILL BE A SIGN ! 2017Shebat29/30 Saw/Published the 26th extension to our 552nd subprediction from 2016Chislev25-2017Adar11, with the 2nd fire sign on 2017Adar2/3, the 86th Solar Asheraian Pentecost (or 7th Sabbath thereof) from 2006Iyyar21, the publishing of our first no show prediction date, and the 3rd fire sign on 2017Adar5, the Laodicean Pentecost from 2017Tebbeth16, when Laodicea was re-appointed as a true non adamic but dry church, a dry land, and the 4th fire sign on 2017Adar13, the 94th Solar Baalian Pentecost from 2005Iyyar14, the fall of the Watchtower as a true church. Moses was led out of Egypt and through the wilderness by the pillar of fire and cloud - all these fire signs. Each nuclear attack WILL BE A SIGN ! 2017Adar3/4 Saw/Published the 26th extension to our 552nd subprediction from 2016Chislev25-2017Adar11, with the 2nd fire sign on 2017Adar4, the 86th Solar Asheraian Pentecost (counted exclusively) from 2006Iyyar21, the publishing of our first no show prediction date, and the 3rd fire sign on 2017Adar5, the Laodicean Pentecost from 2017Tebbeth16, when Laodicea was re-appointed as a true non adamic but dry church, a dry land, and the 4th fire sign on 2017Adar13, the 94th Solar Baalian Pentecost from 2005Iyyar14, the fall of the Watchtower as a true church. Moses was led out of Egypt and through the wilderness by the pillar of fire and cloud - all these fire signs. Each nuclear attack WILL BE A SIGN ! 2017Adar5 Saw/Published the 26th extension to our 552nd subprediction from 2016Chislev25-2017Adar11, with the 2nd fire sign on 2017Adar5, the 2Kings1 chief of the 86th Solar Asheraian Pentecost (counted exclusively) from 2006Iyyar21, the publishing of our first no show prediction date, and the 3rd fire sign on 2017Adar5, the Laodicean Pentecost from 2017Tebbeth16, when Laodicea was re-appointed as a true non adamic but dry church, a dry land, and the 4th fire sign on 2017Adar13, the 94th Solar Baalian Pentecost from 2005Iyyar14, the fall of the Watchtower as a true church. Moses was led out of Egypt and through the wilderness by the pillar of fire and cloud - all these fire signs. Each nuclear attack WILL BE A SIGN ! 2017Adar6 Saw/Published the 26th extension to our 552nd subprediction from 2016Chislev25-2017Adar11, with the 2nd fire sign on 2017Adar9/10, the 85th Asheraian Pentecost (counted inclusively) or the 7th Sabbath thereof) from 2006Iyyar21, the publishing of our first no show prediction date, and the 3rd fire sign on 2017Adar9/10, the Laodicean Pentecost or the 7th Sabbath thereof from 2017Tebbeth21, when Laodicea was re-appointed as a true non adamic but dry church, a dry land, and the 4th fire sign on 2018Nisan13/14, the 93rd Baalian Pentecost or 7th Sabbath thereof from 2005Iyyar14, the fall of the Watchtower as a true church. Moses was led out of Egypt and through the wilderness by the pillar of fire and cloud - all these fire signs. Each nuclear attack WILL BE A SIGN ! 2017Adar10 Saw/Published the 26th extension to our 552nd subprediction from 2016Chislev25-2017Adar11, with the 2nd fire sign on 2017Adar9/10, the Laodicean Pentecost or the 7th Sabbath thereof from 2017Tebbeth21, when Laodicea was re-appointed as a true non adamic but dry church, a dry land, and the 3rd fire sign on 2017Adar10/11, the 85th Asheraian Pentecost (counted inclusively) or the 7th Sabbath thereof) from 2006Iyyar21, the publishing of our first no show prediction date, and the 4th fire sign on 2018Nisan13/14, the 93rd Baalian Pentecost or 7th Sabbath thereof from 2005Iyyar14, the fall of the Watchtower as a true church. Moses was led out of Egypt and through the wilderness by the pillar of fire and cloud - all these fire signs. Each nuclear attack WILL BE A SIGN ! 2017Adar13 Saw/Published the 27th extension to our 552nd subprediction from 2016Chislev25-2018Nisan15, with the 2nd fire sign on 2017Adar16, the 2Kings1 exclusive chief of the 77th weekly Sabbath counted Asheraian Pentecost from 2006Iyyar21, the publishing of our first no show prediction date, and the 3rd fire sign on 2017Adar16/17, the 84th weekly Sabbath counted Baalian Pentecost or 7th Sabbath thereof from 2005Iyyar14, the fall of the Watchtower as a true church and the 4th fire sign on 2018Nisan13/14, the Laodicean Pentecost or the 7th Sabbath thereof from 2017Shebat19, when Laodicea was re-appointed as a true non adamic but dry church, a dry land. Moses was led out of Egypt and through the wilderness by the pillar of fire and cloud - all these fire signs. Each nuclear attack WILL BE A SIGN ! 2018Nisan1 Saw/Published the 27th extension to our 552nd subprediction from 2016Chislev25-2018Nisan15, with the 2nd fire sign on 2018Nisan1/2, the 85th Asheraian BLC Pentecost from 2006Sivan12, our first no show prediction for a US bomb, made in the revised Sign of Jonah letter, and the 3rd fire sign on 2018Nisan13/14, the 93rd Baalian BLC Pentecost from 2005Iyyar14, the fall of the Watchtower as a true church and the 4th fire sign on 2018Nisan13/14, the Laodicean Pentecost or the 7th Sabbath thereof from 2017Shebat19, when Laodicea was re-appointed as a true non adamic but dry church, a dry land. Moses was led out of Egypt and through the wilderness by the pillar of fire and cloud - all these fire signs. Each nuclear attack WILL BE A SIGN ! 2018Nisan3 Saw/Published the 27th extension to our 552nd subprediction from 2016Chislev25-2018Nisan15, with the 2nd fire sign on 2018Nisan6/7, the 77th weekly Sabbath counted Asheraian Pentecost from 2006Sivan12, our first no show prediction for a US bomb, made in the revised Sign of Jonah letter, and the 3rd fire sign on 2018Nisan13/14, the 93rd Baalian BLC Pentecost from 2005Iyyar14, the fall of the Watchtower as a true church. 2018Nisan13/14 is also the Laodicean Pentecost or the 7th Sabbath thereof from 2017Shebat19, when Laodicea was re-appointed as a true non adamic but dry church, a dry land. Moses was led out of Egypt and through the wilderness by the pillar of fire and cloud - all these fire signs. Each nuclear attack WILL BE A SIGN ! 2018Nisan10 Saw/Published the 28th extension to our 552nd subprediction from 2016Chislev25-2018Iyyar11, with the 2nd fire sign on 2018Nisan13/14, the 93rd Baalian BLC Pentecost (or 7th Sabbath thereof) from 2005Iyyar14, the fall of the Watchtower as a true church and the 3rd fire sign on 2018Iyyar4/5, the 77th weekly Sabbath counted 2 witness Asheraian Pentecost from 2006Tammuz2-6, our 2nd no show fire sign prediction. Each nuclear attack WILL BE A SIGN ! 2018Nisan15 Saw/Published 2018Iyyar4/5, day time for the 2nd fire sign and 2018Iyyar4/5 night time for the 3rd from Exodus13 where Moses was led out of Egypt and through the wilderness by a pillar of fire and a pillar of cloud. Each nuclear attack WILL BE A SIGN ! 2018Iyyar5/6 Saw/Published 2018Iyyar11/12, day time for the 2nd fire sign and 2018Iyyar11/12 night time for the 3rd from Exodus13 where Moses was led out of Egypt and through the wilderness by a pillar of fire and a pillar of cloud. Each nuclear attack WILL BE A SIGN ! 2018Iyyar10/13 Saw/Published 2018Iyyar25/26, day time for the 2nd fire sign at the 77th weekly Sabbath counted 3 witness Asheraian Pentecost (or the 7th Sabbath thereof) from 2006Tammuz28/29, the 3rd no show fire sign prediction, and 2018Iyyar25/26 night time for the 3rd from Exodus13 where Moses was led out of Egypt and through the wilderness by a pillar of fire and a pillar of cloud. Each nuclear attack WILL BE A SIGN ! 2018Iyyar26 Saw/Published 2018Sivan3/4, day time for the 2nd fire sign at the 94th BLC Baalian Pentecost (or the 7th Sabbath thereof) from the fall of the Watchtower on 2005Iyyar14, and 2018Sivan3/4 night time for the 3rd from Exodus13 where Moses was led out of Egypt and through the wilderness by a pillar of fire and a pillar of cloud. Each nuclear attack WILL BE A SIGN ! 2018Sivan5 Saw/Published 2018Sivan9/10, day time for the 2nd fire sign at the 1NC Pentecost (or the 7th Sabbath thereof), and 2018Sivan9/10 night time for the 3rd from Exodus13 where Moses was led out of Egypt and through the wilderness by a pillar of fire and a pillar of cloud. Each nuclear attack WILL BE A SIGN ! 2018Sivan9 Saw/Published 2018Sivan9/10, day time for the 2nd fire sign at the 1NC Pentecost (or the 7th Sabbath thereof), and 2018Sivan12, night time, for the 3rd fire sign at the late Laodicean Pentecost, from Exodus13 where Moses was led out of Egypt and through the wilderness by a pillar of fire by night and a pillar of cloud by day. Each nuclear attack WILL BE A SIGN ! 2018Sivan11 Saw/Published 2018Sivan12, day time for the 2nd fire sign at the late Laodicean Pentecost, and 2018Sivan12, night time, for the 3rd fire sign at the late Laodicean Pentecost, from Exodus13 where Moses was led out of Egypt and through the wilderness by a pillar of fire by night and a pillar of cloud by day. Each nuclear attack WILL BE A SIGN ! 2018Sivan13 Saw/Published 2018Sivan16/17, day time for the 2nd fire sign at the 27th Laodicean Baalian BLC Pentecost (or the 7th Sabbath thereof) from 2014Elul17, NOT their fall from being a true church, and 2018Sivan16/17, night time, for the 3rd fire sign, from Exodus13 where Moses was led out of Egypt and through the wilderness by a pillar of fire by night and a pillar of cloud by day. Each nuclear attack WILL BE A SIGN ! 2018Sivan17/18 Saw/Published 2018Sivan25/26, day time for the 2nd fire sign at the 2nd Laodicean BLC Pentecost (or the 7th Sabbath thereof) from 2017Adar17, their reappointment as a true church, and 2018Sivan25/26, night time, for the 3rd fire sign, from Exodus13 where Moses was led out of Egypt and through the wilderness by a pillar of fire by night and a pillar of cloud by day. Each nuclear attack WILL BE A SIGN ! 2018Sivan26 Saw/Published 2018Sivan29, day time for the 2nd fire sign at the 96th solar Baalian Pentecost from 2005Iyyar14, the fall of the Watchtower as a true church, and 2018Tammuz7/8, night time, for the 3rd fire sign at the 2nd 1NC Pentecost or 7th Sabbath thereof, from Exodus13 where Moses was led out of Egypt and through the wilderness by a pillar of fire by night and a pillar of cloud by day. Each nuclear attack WILL BE A SIGN ! 2018Sivan30/Tammuz2 Saw/Published 2018Tammuz7/8, day time for the 2nd fire sign at the 2nd 1NC Pentecost or 7th Sabbath thereof, and 2018Tammuz10, night time, for the 3rd fire sign at the late 1NC Pentecost, from Exodus13 where Moses was led out of Egypt and through the wilderness by a pillar of fire by night and a pillar of cloud by day. Each nuclear attack WILL BE A SIGN ! 2018Tammuz10-11/12 Saw/Published 2018Tammuz21, day time for the 2nd fire sign at the 88th contest Pentecost from 2006Iyyar1, and 2018Tammuz24, night time, for the 3rd fire sign at the 95th BLC Baalian Pentecost from 2005Iyyar14, the fall of the Watchtower, from Exodus13 where Moses was led out of Egypt and through the wilderness by a pillar of fire by night and a pillar of cloud by day. Each nuclear attack WILL BE A SIGN ! 2018Tammuz10-11/22 Saw/Published 2018Tammuz24, night time for the 2nd fire sign at the 95th BLC Baalian Pentecost from 2005Iyyar14, the fall of the Watchtower, and 2018Tammuz24, day time, for the 3rd fire sign at the 95th BLC Baalian Pentecost from 2005Iyyar14, the fall of the Watchtower, from Exodus13 where Moses was led out of Egypt and through the wilderness by a pillar of fire by night and a pillar of cloud by day. Each nuclear attack WILL BE A SIGN ! 2018Tammuz25 Saw/Published 2018Tammuz30, day time for the 2nd fire sign at the 2nd reappointed Laodicean Pentecost from 2018Nisan21 (the 2nd MENE), and 2018Ab4/5, night time, for the 3rd fire sign at the Zoar Pentecost or the 7th Sabbath thereof, from Exodus13 where Moses was led out of Egypt and through the wilderness by a pillar of fire by night and a pillar of cloud by day. Each nuclear attack WILL BE A SIGN ! 2018Ab1 Saw/Published 2018Ab4/5, day time for the 2nd fire sign at the Zoar Pentecost or the 7th Sabbath thereof (the 2nd MENE), and 2018Ab4/5/6, night time, for the 3rd fire sign at the Zoar Pentecost or the 3rd marriage Pentecost on 2018Ab6, or the 7th Sabbath of either, from Exodus13 where Moses was led out of Egypt and through the wilderness by a pillar of fire by night and a pillar of cloud by day. Each nuclear attack WILL BE A SIGN ! 2018Ab6/7 Saw/Published 2018Ab8, night time for the 2nd fire sign at the late 2nd 1NC Pentecost (TEKEL), and 2018Ab8, day time, for the 3rd fire sign, from Exodus13 where Moses was led out of Egypt and through the wilderness by a pillar of fire by night and a pillar of cloud by day. Each nuclear attack WILL BE A SIGN ! 2018Ab9 Saw/Published 2016Iyyar6-2018Elul6 for the extension to our 404th main prediction and 2016Chislev25-2018Elul6 for the 36th extension to our 552nd subprediction and 2018Ab19, night time for the 2nd fire sign at the 97th Solar Baalian Pentecost from 2005Iyyar14, the fall of the Watchtower from being a true church, and 2018Ab8, day time, for the 3rd fire sign, from Exodus13 where Moses was led out of Egypt and through the wilderness by a pillar of fire by night and a pillar of cloud by day. Each nuclear attack WILL BE A SIGN ! 2018Ab20 Saw/Published 2018Ab29, night time for the 2nd fire sign at the 87th BLC 3 witness Asheraian Pentecost from 2006Tammuz28/29, our 3rd no show prediction, and 2018Ab29, day time, or 2018Elul5, the late Zoar Pentecost, for the 3rd fire sign, from Exodus13 where Moses was led out of Egypt and through the wilderness by a pillar of fire by night and a pillar of cloud by day. Each nuclear attack WILL BE A SIGN ! 2018Ab30 Saw/Published 2018Elul1/2, day time for the 2nd fire sign at the 89th Solar/88th BLC Asheraian Pentecost from 2006Sivan12, our 1st no show prediction, and 2018Elul5, night time, the late Zoar Pentecost, for the 3rd fire sign, from Exodus13 where Moses was led out of Egypt and through the wilderness by a pillar of fire by night and a pillar of cloud by day. Each nuclear attack WILL BE A SIGN ! 2018Elul3 Saw/Published 2018Elul4, day time (at sunset on Sunday August 19, which is 20:14 BST) for the 2nd fire sign at the 7th Sabbath of the late Zoar Pentecost, counting from 2018Tammuz16, late Zoar first fruits, and 2018Elul4/5, night time, the late Zoar Pentecost or the 7th Sabbath thereof, for the 3rd fire sign, from Exodus13 where Moses was led out of Egypt and through the wilderness by a pillar of fire by night and a pillar of cloud by day. Each nuclear attack WILL BE A SIGN ! 2018Elul6/7 Saw/Published 2018Elul10, day time (at sunset on Saturday August 25, which is 20:04 BST) for the 2nd fire sign at the 7th Sabbath of the 4th marriage Pentecost, and 2018Elul11, night time, the 4th marriage Pentecost, the 89th contest Pentecost from 2006Iyyar1, the 87th weekly Sabbath counted Baalian Pentecost from 2005Iyyar14, the fall of the Watchtower as a true church for the 3rd fire sign, from Exodus13 where Moses was led out of Egypt and through the wilderness by a pillar of fire by night and a pillar of cloud by day. Each nuclear attack WILL BE A SIGN ! 2018Elul12 Saw/Published 2018Elul14 for the 2nd fire sign (expected at sunset on 2018August28-29), the 96th Watchtower BLC Baalian Pentecost from 2005Iyyar14, their fall as a a true church, and 2018Elul14, night time for the 3rd fire sign, from Exodus13 where Moses was led out of Egypt and through the wilderness by a pillar of fire by night and a pillar of cloud by day. Each nuclear attack WILL BE A SIGN ! 2018Elul13 Saw/Published 2018Elul14 for the 2nd fire sign (expected at sunset on 2018 August28-29), the 96th Watchtower BLC Baalian Pentecost from 2005Iyyar14, their fall as a a true church, and 2018Elul24/25 at sunrise for the 3rd fire sign (2018September7-9), the 80th weekly Sabbath counted Asheraian Pentecost from 2006Sivan12, our first no show prediction - from Exodus13 where Moses was led out of Egypt and through the wilderness by a pillar of fire by night and a pillar of cloud by day. Each nuclear attack WILL BE A SIGN ! 2018Elul15 Saw/Published 2018Elul24, in the evening (expected at sunset on Friday 2018September7, which is 19:32) for the 2nd fire sign at the 7th Sabbath of the 80th weekly Sabbath counted Asheraian Pentecost from 2006Sivan12, our first no show prediction, and 2018Elul24/25, in the morning for the 3rd fire sign, from Exodus13 where Moses was led out of Egypt and through the wilderness by a pillar of fire by night and a pillar of cloud by day. Each nuclear attack WILL BE A SIGN ! 2018Elul25 Saw/Published 2018Tishri5, in the evening (expected at sunset on Tuesday 2018September18, which is 19:07 BST) for the 2nd fire sign at the late late Zoar Pentecost, and 2018Tishri5, in the morning (expected at sunrise on Wednesday morning 2018September19, which is 06:40 EDT) for the 3rd fire sign, from Exodus13 where Moses was led out of Egypt and through the wilderness by a pillar of fire by night and a pillar of cloud by day. Each nuclear attack WILL BE A SIGN !